A rather masculine transvestite named Randall aka Sophia (Aaron Merken) is practicing his lines. Every so often the phone rings, and he lets it go to the answering machine. Still, just hearing the increasingly hostile messages left by his agent and others begins to take its toll on Randall's already frazzled nerves and shaky self esteem. This audition is Randall's last chance, a true make or break situation, and it looks like the smart money is on the latter. However, not everything is as it seems. 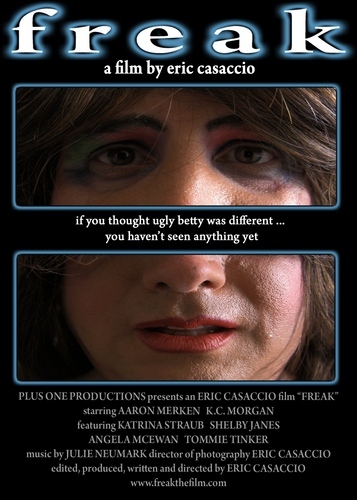 Freak is the kind of short film that doesn't try to be a mini-feature, but rather to capture a particular character in a small but important moment in time. It has a bit of a modern lit feel to it, with the crucial difference that it does have an actual beginning, middle, and end with a satisfying payoff. Writer/director Eric Casaccio gives us a twist that is perhaps a bit on the cheesy side, but overall it's a well made effort with a good central performance from Merken. 2 1/2 out of 3 stars.